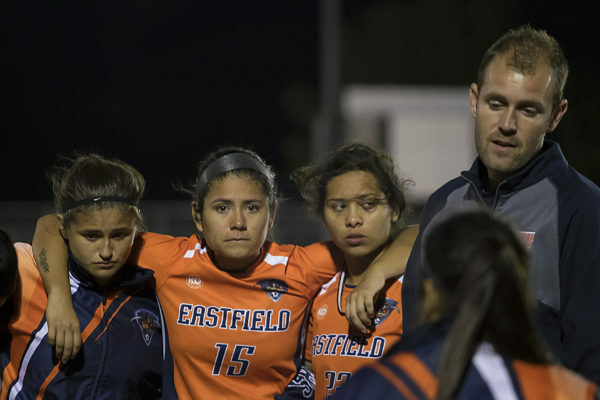 Eastfield women’s soccer head coach Dustin Stein announced his resignation Monday via Twitter after accepting a job offer as an assistant coach at the University of Pittsburgh. Stein said it was a can’t-miss opportunity to work under Pittsburgh head coach Randy Waldrum. He said it was bittersweet parting with his “baby” but its future looks bright. He leaves with a 56-32-4 record, making him the soccer program’s most successful coach. Although he never reaching the national tournament, he did lead the 2015 team to their first conference title, going undefeated during the regular season. Stein said the base for the future is still there and that a really talented freshmen group is returning as sophomores for a new coach. Stein said assistant coach Hannah Poenisch is taking charge of the team for spring offseason and is handling the team’s recruiting so the players will start getting used to him not being there. Stein hopes to mirror his Eastfield success at Pittsburgh, which has been struggling recently in the Atlantic Coast Conference. He said he knows it’s significant jump from coaching a two-year college team.